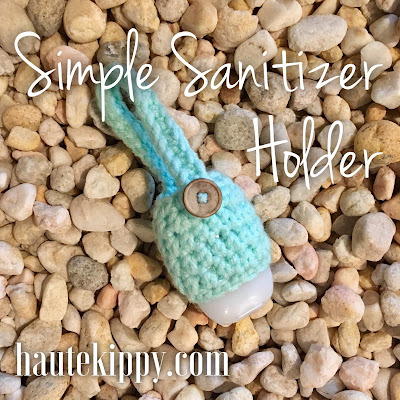 You totally need this new super simple, quick and easy sanitizer holder for a very obvious reason. Let me explain: The first sanitizer holder I made is really adorable and has little bitty berries on it! Only problem.... Bath & Body Works went and changed their whole mini sanitizer bottle style as soon as I got the design done! My dear cousin Letetia, for whom the Tisha Bow Headband is lovingly named is a fabulous LuLaRoe clothing consultant. We love to support each other in our respective endeavors and often team up as such. 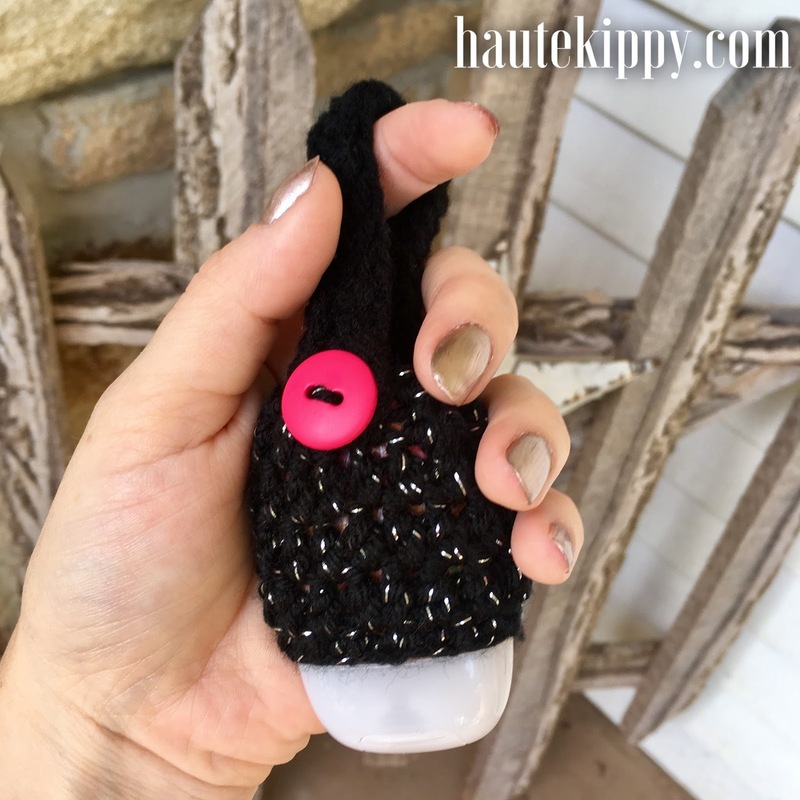 She likes to treat her customers to a gift with purchase and since we both have an obsession with Bath and Body Works (I'm an admitted Pearberry addict) we decided on mini hand sanitizers outfitted with my adorable crocheted holders. It's a brilliant idea, and they are a hit for sure! It was through these little prizes that I came up with the simple, quick working yet sturdy and fun sanitizer holders. And now that we have a new rounded mini sanitizer bottle design I've re-worked the pattern for a whole new experience! You're going to love it. I'm telling you folks, this is Christmas- DONE! Thank you gift- NAILED! You need do nothing more than trot off to the mall, grab a dozen of these lovely little babies, get to hookin' and you'll be covered for nearly every gifting occasion you can think of. I even gave one to my daughter's teacher at the end of the school year. Everyone loves these, you simply can't go wrong. I know, I digress... but seriously #notspons. This easy pattern can be made in any worsted yarn. I have used dozens of colors and made countless holders and they all work like a charm. You may be wondering, "but hey girl, those bottles are round and they don't have much of a neck and won't my sanizier just slip out of the crocheted holder once it stretches, as does all crochet?". Well no. I made myself one in dreamy, luscious Red Heart With Love in Minty and it has been on my purse for at least a couple months. In fact the sanitizer is almost all used up. It's been through the airport, yanked on by toddlers, banged around, pulled and used nearly daily and that fat little round bottle has not even looked like it was going to budge. I'd wager to say it works! All you need is a small ball of any worsted yarn, your H/5mm hook, and a small button. I like to use buttons between 7/8" and 1" in diameter for this project. It adds visual interest and gives you something to look at in contrast with the simple pattern. 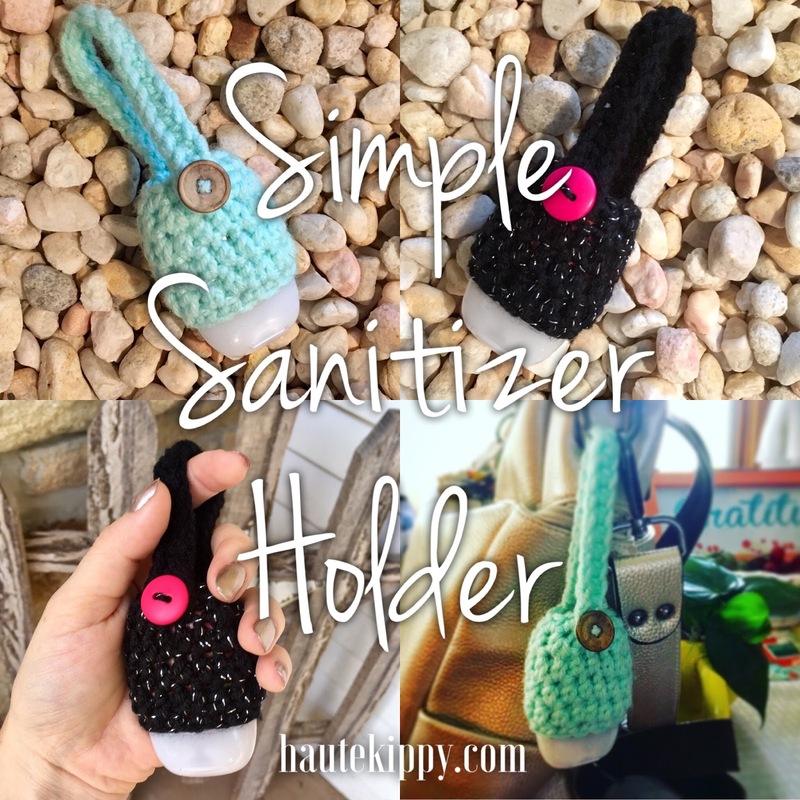 Check out this amazing bundle of mini hand sanitizers! You could work the holders while you wait. I bet you could make a dozen by the time your sani's arrive! hdc inc - half double crochet increase: make two hdc in the same st.
hdc2tog - half double crochet two together: a hdc decrease. For your convenience, a printer friendly PDF download of this pattern is available in my Ravelry Store! 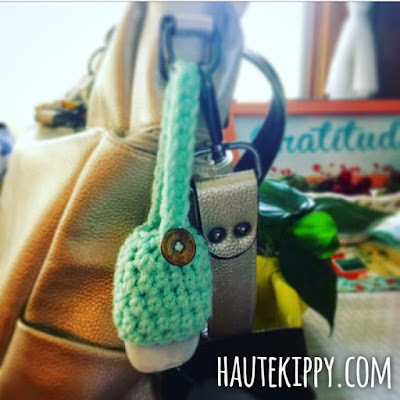 Click the button to get yours now, and thanks for supporting more free content from Haute Kippy! Round 1: sc in each ch around, join with a sl st, ch 1. Round 6: sc in each st around, join, do not break yarn. 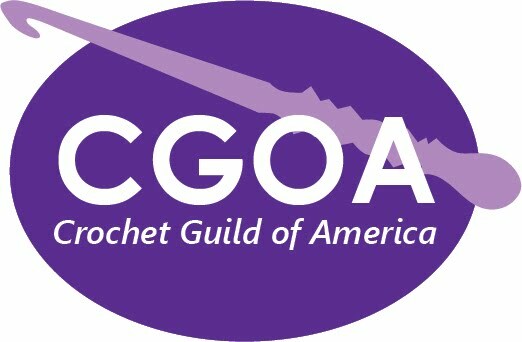 Ch 24 to form the closure strap with button hole as follows: hdc in second ch from hook and in each ch across back down to last row on holder (22 hdc), sk one st, sl st to next st, pivot to work back up the strap, sl st in each st across (22sts), ch 4 to form buttonhole, sl st to other side of strap, fo, weave in ends. Finishing: Sew button onto top center front of holder, weave in all ends, insert sanitizer bottle with lid pointing down, fasten strap around any bag using the button closure. Be sure to share your work by posting to my facebook page, or using #hautekippy on Instagram. 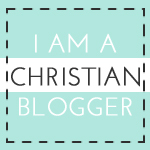 You can follow me on Pinterest and Ravelry too! Be sure to look for other summer inspired easy and fun crochet patterns on my favorite free pattern website: allfreecrochet.com! Leave me a comment below letting me know what you think of this pattern and please react with LOVE any time you see a post from Haute Kippy on Facebook!